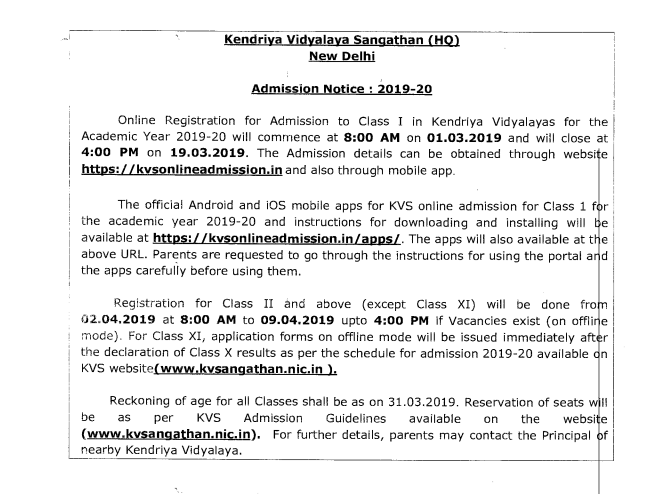 The department of Kendriya Vidyalaya Sangathan (KVS) has not issued the official announcement of Kendriya Vidyalaya Sangathan (KVS)/Central School Organization (CSO) detailed notification of admission in Class First to Class Twelfth standard 2019 application form by the official website portal. Application are invited from the eligible and interesting students commence from 1st March 2019. Registration for class second and above except class xi will be done only if vacancies exist. For class xi, application forms will be issued immediately after the declaration of class x results, subject to availability of vacancies in the vidyalayas. 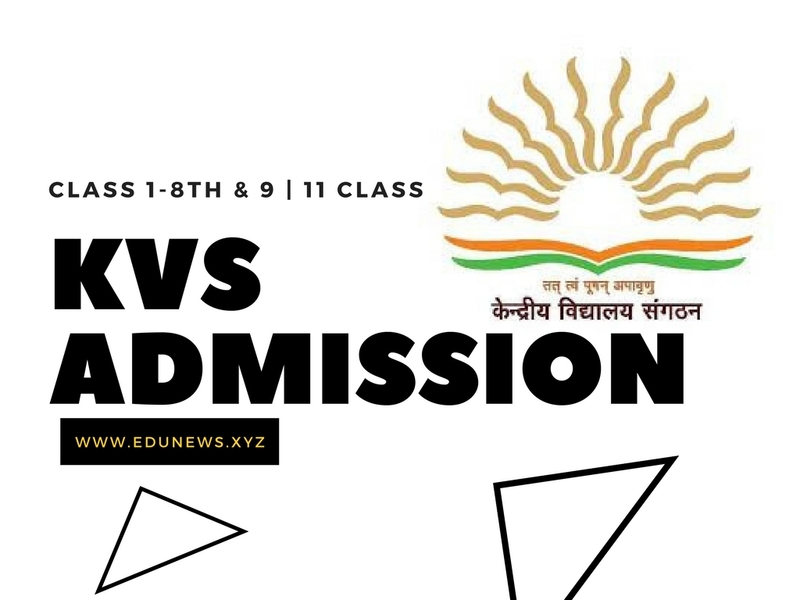 Kendriya Vidyalaya Sangathan (KVS)/Central School Organization (CSO) is going to circulate the press issue notification form admission into Class I to Class XII Application Form by the official website. Candidates who are interesting and applicants may submit the application for Class First from 1st March 2019 to 19th March 2019. KVS Class Two and above classes registration process are started from 02/04/2019 through offline. The admission list will be displayed on 12th April 2019 and based on admission list all the applied students can take admission till 19th April 2019. Note -> The maximum age limit can be relaxed by two years in case of Differently abled children by the Principal. There is no upper and lower age limit for admission into Class XI and Class XII. There is no fee to be charged from the candidates for admission forms. For seeking admission into Class First merit list drawn up by the KVS/CSO category wise seats allocation to the student. Admission test shall not be conducted for admission in Class 2nd to 8th and the admission may be granted based on priority category system (1 to 5 or 6 as the case may be). If Applications are more than the number of seats, lottery system will be followed in each category including single girl child quote (Class VI onwards). Candidates shall be admitted to Class IX on the basis of their performance in admission test and merit list will be prepared for each category of priority separately. Admission shall be granted in the sequence of priority category in order of merit. Admission in different streams viz Science, Humanities, Commerce of Class XI in KVs will be based on CGPA scored in Class tenth. 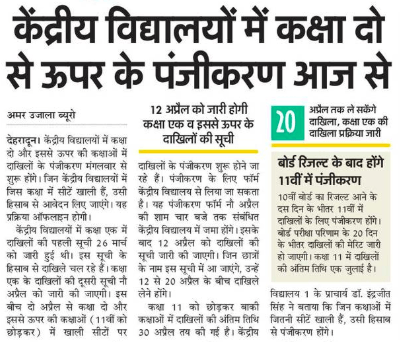 If the Seats remain vacant in class XI even after admitting the children of KV, then the admissions to non-KV children may be granted in the sequence of priority category. For seeking admission into Class X, candidates must have obtained not less than 6.5 CGPA in Class IX (CGPA be calculated as per formula applied by CBSE in Class X). For Admission to Class XII, students must be obtained 55% Marks as mandatory in Class XI. There will be only one paper of Admission Test of 3 hours duration with 100 marks comprising Hindi, English, Math, Social Science and Science each of 20 Marks. Kendriya Vidyalaya Sangathan, for Granting Admission to the Wards, shall Accord Preference to the Numbers of the Transfers of the Parents in the Last 07 Years. Self-Employed Persons, Persons in Private Sector and those from Floating Population are also Eligible to apply for Admission of their Wards into Kendriya Vidyalayas. However, Admission will be Granted in order of Priority Specified in the Guidelines for Admission into Kendriya Vidyalayas. Category 5- Self-Employed / Private Services / Floating Population. One may Apply for Admission of a Single Child for the Same Class in more than one Kendriya Vidyalaya, if Vacant Seats are Available in a Particular Class. (Kindly Se on Vidyalaya Notice Board and Kendriya Vidyalaya Website.) Separate form is required to be submitted for each Kendriya Vidyalaya. The Parent(s) may get Information about Selection of his / her Ward for Admission? The Parent may View / Check out the Status of Application using ‘Application Status’ Link. The Details would be Available on Vidyalaya Notice Board and Vidyalaya Website. It is for Classes I up to XI as per the respective Admission Schedule. Necessary Original Certificates and other Relevant Documents from which the Details have been filled in Online Application for Registration) in respect of Children Selected for Admission through Draw of lots, will have to be submitted to the Kendriya Vidyalaya Concerned at the time of Admission. प्रवेश के लिए वरीयता क्रम? किसी बच्चे के प्रवेश हेतु चयन की जानकारी कब और कहाँ प्राप्त होगी? Date of Birth Certificate issued by the Competent Authority. Certificate Issued claiming Child’s Relation with the Honorable Member of Parliament / Public Enterprises Employees. Certificate Issued in case of Grandchild’s Relationship with Kendriya Vidyalaya Sangathan Staff. Certificate in support of Claim in case of Other Backward Classes (Creamy Layer / Non-Creamy Layer) Scheduled Caste / Scheduled Tribe / Persons with Disabilities / Physically Challenged Candidates. Its okay sir but not the two students with one name sir, I have seen one name only her father name same, contact num same,D.O.B also same name 2 times in single list. Sir, now 2nd list has been updated any 3rd list or waiting list will release. Dear Divya, It was the mistake of KVS department. SO, you dont take tension they will improve their mistake shortly. Dear Divya, There will be two students with one name. So dont take tension about that. We have submitted the application for our child’s 5th class admission..How/Where we can find the status of the Application..
Dear Durga, You may find you status either from the official website or KVS across the country very soon. Till then keep visiting here. Dear Shakti Shahi 11th Class Admission will be start after declare the Xth Class Exam Result 2018. Dear Shakti Shahi, The eleventh class admission process is going to commence soon. Hai @hitesh We have submitted the application for our child’s first class admission..How/Where can I find the status of the Application..
Dear Sai, Please following us, Because We will soon provide you information regarding your Child’s admission. Dear Sai, AT this time admission process running till 09th April 2018. So, KVS will display after 15th April 2018 list of students who got seats in first class at the website of KVS. Im trying from 3 hours but how to register still dont get. Please help. Online admission form available ni hoga kya…?? Dear Poonam, KVS admission form is already started through offline till the 09th April 2018. Sir, Can we fill the online registration from after 9th April 2018 for Class 9th or not….??? Dear Poonam, No, you cannot fill online form because at this time only offline you may registered for 9th class till 9th April 2018 because after that registration process is closed. Can i fill the online form for Class 9th after 9th April 2018 or not….?? Dear Surbhi Rani, There is no online form are available. If you wants to takes admission then you may apply for registration through offline till 09th April 2018 in Kendriya Vidyalayas across all the country. Hi mam we are waiting for online application for 3rd class they started from 2nd till now site was not opening .How can we proceed for our child admission . Dear Ameerbee, You may apply for the registration through offline mode only in kendriya Vidyalayas across the country. dear vivek, You cannot filled the online form because at this time only through offline mode in Kendriya Vidyalayas across the country. My brother son is studying in KVS, Jammu. He is shifting to tamilnadu. Can we get admission for class 2 in tamilnadu under defense quota? From today onward class ll and above admission process starts but on which web site do we have to get registered to fill up the admission form for class V admission. Dear Sharad, Now the admission will be done only offline at KVS across the country. All the students may apply for the registration for admission to Class First (left out vacancies) and Class 2nd to Class 9th commence from 2nd April at 08:00 AM to 09th April 2018 up to 04:00 PM through offline mode in Kendriya Vidyalayas across the country subject to availability of vacancies. Dear Ravi Saxena, KVS 9th class admission form stared from 02nd April 2018 through offline mode. You may apply for registration till 09th April up to 04:00 PM through offline mode in Kendriya Vidyalayas across the country. meri sister ka admission class 6th mey karna hey ap muhje link deydo taki mey admission kar pauuu…. Dear Abhay Jat Class 9th Admission will be start after declare the 10th Board Exam Result. Dear Sir. I am looking for admission for my daughter into class 3. Single girl child admission. Plse let me now the procedure. Dear G.Suhasini Click our links follow the official website Application Form For Class 3rd Admission Procedure. Dear Sir/madam. Can we apply for single girl child.. When admission r going to open…. I have applied in KVS(Picket)Even My daughter also comes under RTE(NCL) category 5, few students have selected under this category, my daughter didn’t get under this category, is 2nd list will be released. how the selection process is going on.Plz reply me. Dear Rohit Ganesh Farnamde, Keep some patience because will intimate you shortly at this web page. You can go School First and verify your Son Documents. Dear Prity Kumari, Now admission in first class is over so, you may apply for the next year. When Will Open The Admission Shedule ? I have selected category 5 in class 1 service category, but i got messages to update correct certificate. is any problem will effect in selection process, i have applied OBC ( Non-Creamy Lawyer certificate) and my husband is private employee, the certificates size is 256MB so it may be small size and also the certificate no. i have entered in list. and one more doubt i am contract employee, the certificate of mine uploaded in documents list i want to delete that certificate its not showing the option whatever the certificate is uploaded previous its showing the same.. I have tried this one before 19 of march.. but showing the same certificate. so i am getting tensed if this certificate taken into consideration for my daughter will get seat or not. other than all information was correct the only thing is i got 2-3 messages from school to update category 5 even i have updated. plz reply me. Sir,when will be the application form will upload? Dear Unmanned Surface Vehicle, Thanks you please follow us regularly. Dear Iniziar, Pleasure of Mine and we are happy to serve you. For more details keep stay with us. sir, I need admission for 2nd standard and 5th standard. Is it available. Dear Sumi S L, KVS 2nd & 5th standard admission form is released from 2nd of April 2018. Sir, im trying from last 3 hours but still dont get that how to register. Plss help. Dear Vinod Kumar Yadav, the online admission for class ninth is started from 2nd of April 2018. Sir, I want admission of class 4 student. It is possible. If it possible. Tho kab tak hoga . Itreally a great and helpful piece of info. I glad that you shared this helpful information with us. Please keep us informed like this. Thanks for sharing. Hello mam, my son is 5.2years old and at present he is in jr.kg standard. I want his admission in sr. KG in KVS, is it possible or not. Dear Sir/madam. Hai dis is Suhasini as I am looking for my daughter admission for class 3rd ..
Dear G.Suhasini wait for the some time KVS Online Admission Form will be as soon as soon announce on official website. Please,send me the link of online admission for class 11 whenever the form will open send me the notification also. Dear sangeeta Rajpoot, KVS 7th standard online admission form is going to commence from 02nd of April 2018. For more reference keep stay with us. Dear Krishan Kumar, Firstly uyou may apply fopr the first class admission course because this thing is only decide by the KVS admission authority. Dear Ganesh, At this time KVS first class admission registration process are already started. For details keep stay with us. We are trying to log in since the registrations started on march 1st but till date page is not getting opened.Always giving message as server down.It has been six days the situation has not changed.Appreciate the concern authorities to look in to this on priority. sir mene apne son ka registration bhar diya h. but login nahi kar pa raha hu. muje apne son ka class-1 me admission karana h. please issue direction/guidelines . from past 6 days i’m trying through online for applying admission for 1st standard. but i cant apply because of network busy. i’m now tensed whether i can process or not. plz guide but also help. Dear Jyoti, You may trying again and again. Because there are so many people are trying that’s why server is busy. Dear Sheriful Islam, Will you speak in Hindi Or English because i don;t under your language. Dear Gajanand Meena, At this time KVS first class admission process is started but Class 2nd admission process has commence from 2nd of April 2018. For more details, students may follow us. Pls confirm me class v vacancies when will open? it’s not showing vacants . Dear Sandya, KVS Class Fifth Online admission form is going to start from 02nd April 2018. Online admission portal yet to not open . Dear Sankar Naskar, Online registration for KVS first class admission has already started. so, you can take registration till 19th March 2018 through the log in to official website. Sir mere bete ki dob 03/07/2011 h .uska admission 1st m ho skta h? Sir mere bacche ki grandma crpf m h to Kya isse admission m koi benefit mil skta h.
Dear Mani, There is no benefit in this case because as per notification, if child’s mother/father have government jobs only that case students takes benefit at the time of admission. Dear Radhika, First class admission form in KVS are starting from 1st March 2018 to 19th March 2018.
please give me the correct link to open the admission form for 1st standard year 2018-19. the link you gave before (http://kvadmission online 2018.in) is not reponding correctly. we want to get admission in kv bhandup. Dear Selvakumar, AS soon as possible link for online registration process is starting responding. till then keep stay with us. Dear Komala, KVS second class online registration process is going to starts from 2nd April 2018 to 09th April 2018. My son date of birth 07.07.2010 can I apply class 1 ?? Kendriya Vidyalaya Sangathan has issued Online Admission Notice for Class I for the year 2018-19. As per the Notice Online Admission starts from 1.3.2018 8:00 Am and last date is 19.3.2018 up to 4.00 PM. there is no such notification in the above website. KVS – Class I admission (2018-19) will commence from 01-03-2018 at 8 am to 19-03-2018 4 pm. Dear Devendra Singh, KVS online registration for class starts from 01st March 2018 to 19th March 2018 and class II & above admisison starts from 02nd APril to 09th April 2018. For more updates stay tuned with us on this portal. Kindly share the admission update once it announced . Dear Kishan Singh, Online KVS admission form dates shall be released out very shortly. My son DOB is 6th April 2013, now studying UKG, he is eligible for 1st class or not, kindly give the reply. My children will be in 6th and 4th class for next academic year. What’s the procedure. Kindly update. Please tell us when will the class 1 admission will start. Dear Jai, the schedule of KVS class 1 admission is going to commence soon. further details keep stay with us. Dear Ramesh, KVS 1st standard admission process will be commence as soon as possible. Till then keep visiting this web portal. Mam class 9th ke admission kab se start h .
Dear Ratheesh, Whenever KVS first class admission process released then we will inform you at here. I like to admit my ward in 1st std in KV school. Till date the link for online registration is not activated. Kindly inform the no. of days offered for online registration. Also info required regarding documents to be submitted along with the online application. Sir, please infrom me 1st class admission date of KVS. I have first girl child. i am from KOLKATA. Please message me for admission in Ist class boy child, 3rd class girl child and 7th class girl child in K.V.School 1,2,3,4 Ambala . Please inform my mail I.d. Sir,plz inform me admission date for grade 1.i m from bangalore. 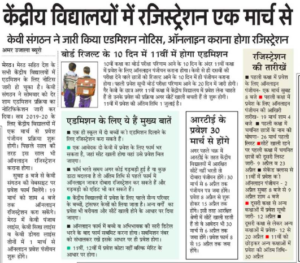 Sir, when will online admission for 1st standard in KV starts. I am from Hyderabad, when will be admission for class 1 year 2018-19 will start. Please let us know. Sir, Please request to know you that, when will be start online registaton form fillup for class-5th from KVS. Sir, Please request to know you that, when will be start online registaton form fillup for class-1 from KVS. Dear Manvinder Singh, KVS online admission form for first class 2018-19 session will be commence shortly. Till then stay tuned with us. when class 1 admission will start. Dear reena Dubey, The admission is going to starts from 2nd April 2018. Sir, I request you to know that, When will be started online registation form fillup for class-1 from KVS ? Sir when will the registration form starts online , I want to fill for 8 th of my daughter. When we can apply for admission in 1st class. Dear Tamanna, The dates for KVS 1st class admission form will be released as soon as possible. for more information keep stay with this portal. 1st class ke admission kab start honge. Hum January se wait Kar rhe h. Plz inform me. Is there any priority given to single parents????? 1 class ke liye online from Kab se start honge kv 2 Agra ke liye. Dear Dherendra Singh, Second Class KVS agra admission form will be started later at the website. Dear Neelam. Our team is going to notify soon the KVS first class admission form at this web page. So, please stay tuned with us. Hiii mam, 4th std. Ka admission kab start Ho raha hai. Plz replay…. Dear Reshma Rathod, The admission form for Class fourth KVS 2018-19 is likely to announce very shortly. My son DOB is 6th April 2013, now studying UKG, he is eligible for 1st class or not, please confirm me. when will be the applications will be starting for 1st class.. pls inform sir…. Dear Afshiya, Hereby we will display the kVS admission form dates shortly. For more details, students stay tuned with us. Dear Sachin Tandiya, KVS first class admission form 2018-19 will be outed soon at the official website. Dear G S Umashankar, The KVS first class 2018-19 admission form will be started soon. For more details keep in touch with us. Sir it’s too late plz tell me how long time I will wait for online admission class first . Dear Mani may be KVS Admission will be starting at April Month so, keep patients KVS Admission application form will be soon announce on official website. Sir but last year admission start 8 Feb 2017. Dear kalpana we are expecting KVS will be April Month to start a Admission Application Form on official web-portal. When 3 rd class admission application will start. Sir I want to know when will be the admission start for class 1 for my daughterin KV . I need Admission for my Twin Daughters for 1st Class. My Daughters are Born on 15-May-2013 ( 4 years 10 months 16days—-> till March 31 2018). Are they Eligible for coming Academic year 2018-19; for 1st class. Right now they are in Sr. Kg for 2017-18 year. The Age Criteria for 1st class child must be 5 years old. But my Twin Daughters are (4 years 10 months) near to 5 years old. Can I apply for 1st class admission, if online admissions take place near future. If I apply for 1st class admission with the same age(4yrs 10months). will KV is going to accept the online form or will they reject because of age criteria. Dear Rajnikanth, If you apply for KVS online fist class admission then they will rejected obviously. Please share the date of admission in class 1. Dear Pakiza Khan, KVS admisison form 2018-19 session for class first will be started shortly. Dear sir class vi admission kab sa hoga. sir, I need admission for my daughter for 1st class, kanchanbagh, Hyderabad location. Please can you tell me when it will start online application for 1st standard? dear sir i need admission for class 5th. in Kvs – Sulur is it possible to get it. Sir first class admission when will be starting. Kindly let me know when will start admission for class 6, preferred school Kendriya vidyalaya Happy valley Shillong Meghalaya . Dear Monish Bhattacharjee, KVS online admission process for class sixth standard will be started soon through the official website. Dear Tapas Saha, The KVS online admissions process for 1st class admission is going to commence shortly. For further updates keep in touch with us. This message is third one from me regarding to know the notification for the class 1st Admission 2018.Appreciate the admin to let know the tentative time to help the visitors anxiety.As it has been too late with comparison to the last year 2017 admission. Sir 1st class k admission kab honge plz reply me. Dear Jitender KVS Online Admission application form will be soon start. Sir when will u start the admission for class 1st kindly reply me. When will start the addmission for class 5 th standard? single girl ke liye kya proof chahiye admission ke liye, single girl ki seat reserve hoti hai ya nahi? Hi HItesh – single girl ke liye kya proof chahiye admission ke liye, single girl ki seat reserve hoti hai ya nahi? Hey, thank you for your helpful article. PLEASE LET ME KNOW WHEN WILL BE THE ADMISSION OF CLASS 1st GOING TO START AND ALSO THE LAST DATE OF SUBMISSION. Let me know about the admission status of class 1. Dear Sir/Madam. Please let me know the starting date and last date for online admission 2018-19 in class IX. kindly inform me the date of admission into Class I through online. I was blast injured on duty and presently 65% disability. My only son study in Spring dale Primary School kalyani Class – III. Kindly tell me your procedure. pls infrom me when 1 class admission from relese. in kvs for Bhubaneswar admission. pls infrom me when 7 class admission from relese. in kvs for kolkata admission. When will start admission of class 1. Dear, Kumudh, The KVS online admission form for class first will be opened shortly through the official website. The starting and closing date of class 5th KVS 2018-19 admission will be announced later. 1 class ki notification kb jari ho rhi h.
M apne 2 beto ka admission kendriya vidyalaya me 1 or 9 class me karana chahta hu. please notification ke bare me batana. mob. no. 9958758121. I want admission of my sons in class 1st and 9th. Please advise about the procesure as well as admission notification during the academic session 2018-2019. When are you going to start Class I admissions for 2018-19. We are eagerly waiting for the same. Class I ka Admission kab se Shuru Hoga Kripya Suchana Deve. I am looking for the date of admission for class 1. Dear Dharma, KVS Online Admission form dates for class 1st standard is going to released out soon. Dear Amit SHarma, Hereby we will inform you KBS online 5th standard admission forms date very shortly as per the official announcement. Dear Aastha Verma, Don’t take tension mam because whenever date of admission for 1st class released then we will inform you at here. Dear Deepanshu, The admission 2018-19 form dates will be outed very shortly at the website. Dear Srilatha, AT this time schedule opf 1st class admisison 2018-19 has not yet started . So, till then keep stay with us. Kindly let us know when will the admissions starts and request you to kindly send the link or website. when will the 1st class admission(HYD) is going to start. kindly reply. When will be online admission dates start for class 2 and class 6 kindly confirm the dates. Plz let me know the 1st class admission 2018-19 starting and last date.plz shear the link. When will you start addmission first class standard in online application form ..
Sir plz let me know the date of admission class first. When will start the process of online admissions for class 1 for the academic year 2018-19? Please let me know the starting date & Last date for online admission 2018-19 in Class – I. If possible please share the link & process for the same. Please let me know when will be the admission process for class 2 started? Please share me date of admission for first class 2018-19. 1st standard admission kabse start Hoga ??? Plz reply. Online admissions 2018-2019 starting class- 2 and class-6. Dear Arun Kumar Goud, hereby we are informed you that the online admission process schedule for KVS Class 2 & Class 6 is going to release soon. Dear Sangeetha, KVS will take some time to commence the KVS 2nd & 4th Class admission forms 2018-19 through the website. For more reference keep in touch with us. Admission of class 1st when it will start i was go thorough website but link was not found . please help me and inform me after start the admission process of class 1st. Dear Arvind, KVS online admission process dates will be displayed soon at the website as per the official announcement. Dear Sanjay, At this time, KVS Online admission 2018-19 has not started. Whenever it released then we will inform you here. Please intimate the date of commencing Class I admission for KV. Please tell me , when will started online Registation for class 1. Please let me know the starting date & Last date for online admission in Class – I. From when will the online application be open on the official website of Kendriya Vidyalaya. When the admission will start for Class 1. 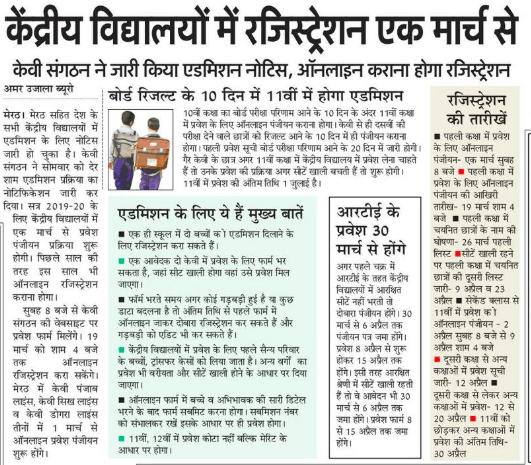 Everyone can apply on KVS School? Dear Vaibhav Garg, KVS Online admissions 2018-19 will be announced later at the website. Till then keep in touch with us. Class Frist ki Admission kab start ho rahi hai g ?Kya kvs main ews Kota bhi hai? Plsssssssss tell when the online admission will open.Tell the admission date and last date plsssssssssssss. Last year by this time they started the admission online. but this year why this much delay. I fear if i would miss it. Please let me know when they are notifying. Dear Poornima, if you have any doubts then you should visit at the official address of KVS. when will the start class I online admission and last date .please kindly sent details for me. Dear Rathinavel, At this time, KVS Class 1st online admission process will be started soon. For more reference keep stay with us. Dear Malathy, Hereby we will update you soon the date of KVS online admission form dates at this web page. For more details keep stay with us. Dear Darshan Gadhavi, The admission form for class first 2018-19 session will be started later. For more reference, please stay with this web page. Dear Zulkamain Sheikh, The dates of online admission has not yet announced. For more details, keep in touch with us. Dear Ramakrishnakumar, Hereby we will notify you KVS 3rd class admissions for 2018-19 shortly through the website. Kvs 1st class admission form kab se niklenge? Dear Aman, The KVS online admission form for class 1st standard will be announce later at the website. For more reference, keep in touch with us. what is the last date of class 1st registration ?? Can I have a date for the forms of 1st standard to be given in the website? Dear Mahesh KVS Admission Application Form 2nd Class Starting date is 2nd April to 9th April. After 1st April you can download the Admission Form for Class IInd. Sir when online admission will be there for std 1st in Thane . Dear Asha Ramakant Chile, The online admission process for first standard will be started soon on its official website. Dear Karna Chaturvedi, Hereby we will inform you soon the class ninth admission dates on its official website. For more updates, candidates may keep in touch with us. I also wants to know what is the date for class 8 and 9 and what is the procedure behind it..
Dear Neeraj, Whenever application form for 1st class admission started then we will inform you at this portal. Dear Ramesh S, The KVS Online Admission form for class first will be started later as per the official announcement made by KVS. Dear Aman. Class VIII & IV admission is going to starts from 2nd April 2018 and last date of admission is 09th of April 2018. Online application form for class 1fill up date is12/3/18. I wanted to when result out. Dear Chandra Mohan Kandari, Yeah sure, Admission can be done for Class 4th KVS 2018-2019 session. Yes Mr. Namaskar g, You can have a admission for single girl child . Kindly go through the KV Admission guidelines to complete the admission process. Dear Semwal, KVS 7th & 9th admission is going to commence from 02nd of April 2018. For more reference keep stay with us. Dear kallu Ram KVS Online Admission Application Form will be very soon announce on official website so, you can wait for the some time later KVS will be soon declare the Admission Application Form 2018. Please ! Notify me about first class apply and closed date and give notification link on my mail. Dear Saikat Bose, The class first admission form 2018-19 for KVS School has not yet released. So, whenever it issued then we will notify you at our web site. Dear Amod, KVS Online seventh standard admission starts from 02nd of April 2018.